My friend, Charli Prangley, and I would often chat about issues we face as designers and freelancers. After a while we realized, ‘Hey, we should be recording these!’, and our side project “Design Life” was born. “Design Life” is a podcast about design and side projects for motivated creators. We saw a gap in the podcast market for a conversational show about design and the issues young creatives face. As female serial side project addicts, we felt there was a need for more female voices in the podcast and design industry, and that we had interesting stories to share. We release an episode every Monday. Our conversations are about design and the issues creatives face as they try to progress their careers, juggle side projects, stay motivated and bring ideas to life. Along with the podcast, I also interview underserved creatives in “The Creative Series.” I grew tired of seeing the same popular and famous designers being featured in all of the magazines and publications, so felt there was a need to showcase the lesser known, but equally as talented and inspiring creatives in our industry. 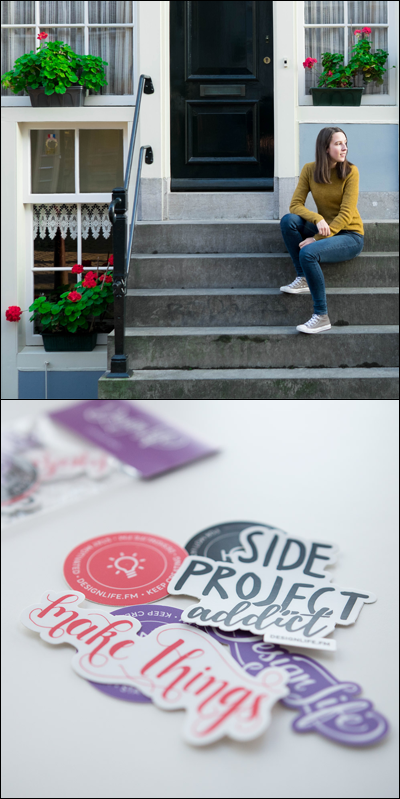 Lastly, I write articles and help people pursue their side projects through my newsletter and website Femke. I love helping people by sharing my stories, struggles and experiences. Common topics that I discuss are things around running an effective freelance business, dealing with clients, work/life balance, overlapping the day job with a side project, clear mindset and imposter syndrome. You can subscribe here. One of the best things I’ve learnt, since working on side projects, is that there is no such thing as more time. It’s up to you to make time for things important to you. Since adopting this mindset, I’ve managed to accomplish far more in my side projects than I initially thought was possible. I make time for the tasks on my to-do list or the meetings that I have by treating them as priorities and scheduling them in my day. As I have a day job, scheduling and making time for my side projects is the only way I’ll get the opportunity to work on them. Establishing a routine has also been immensely valuable for my productivity. I wake up at the same time every day and spend the first two hours on side projects before logging in to my day job. This time in the morning provides me with uninterrupted and dedicated focus time. Lastly, you have to have passion for your side projects. If you lack passion, you’ll find excuses to not work on them. Choose a project that you know you’ll be passionate about and know you’ll want to commit to, even when the forces are against you. There are so many benefits to starting a side project. Maybe you want a creative outlet to fulfill a passion of yours that’s not currently being fulfilled elsewhere. Alternatively you might want to grow an audience through helping and teaching people by sharing what you know. Your side project could be something serious or something completely fun—it doesn’t matter! There’s so much to be learnt from a side project. For me, my side projects help challenge me in areas that are unfamiliar territory, learn and grow, and develop relationships with an awesome community of people. It’s incredibly rewarding when you’re able to help someone with something they’re struggling with. Photography by Owen Williams and Charli Prangley, courtesy of Femke van Schoonhoven.